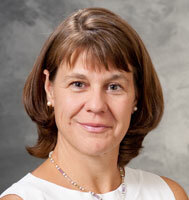 Dr. Scerpella is head of the Division of Sports Medicine. She specializes in sports medicine and in arthroscopic reconstructive surgery of the shoulder and knee, including anterior cruciate ligament reconstruction, meniscus repair, rotator cuff repair and capsulolabral reconstruction for the treatment of shoulder instability. Dr. Scerpella's research interests include bone mineral accrual during childhood, bone mineral density and tibial stress fractures/medial tibial stress syndrome, and functional outcome of arthroscopic rotator cuff repair.